I have accepted with pleasure the invitation that you have addressed to me, Mr. President, on behalf of the International Fund for Agricultural Development (IFAD), for this opening ceremony of the forty-second session of the Governing Council of this intergovernmental Organization. My presence is intended to bring here the desires and needs of the multitude of our brothers who suffer in the world. I wish we could look at their faces without blushing, because finally their appeal had been heard and their concerns addressed. They live in precarious situations: the air is contaminated, natural resources are depleted, the rivers polluted, the soils acidified; they do not have enough water for themselves or their crops; their sanitary infrastructures are very deficient, their houses scarce and defective. And these situations continue at a time when, on the other hand, our society has achieved great achievements in other areas of knowledge. This means we are facing a society that is capable of advancing its purposes of good; and the battle against hunger and misery will also win, if it is taken seriously. Being determined in this fight is paramount, so that we can hear – not like a slogan but as a truth – “Hunger has no present or future. Only past”. For this, it is necessary to have the help of the international community, civil society and those who possess resources. Responsibilities cannot be evaded, passed from one to another, but rather are to be assumed so as to offer concrete and real solutions. These are the concrete and real solutions that we must pass from one to the other. The Holy See has always encouraged the efforts made by international agencies to address poverty. Back in December 1964, Saint Paul VI requested in Bombay and subsequently reiterated in other circumstances, the creation of a Global Fund to combat poverty and to give a decisive impetus to the comprehensive development of the most impoverished areas of humanity (cf. Address to the participants in the World Conference on Food, 9 November 1974). 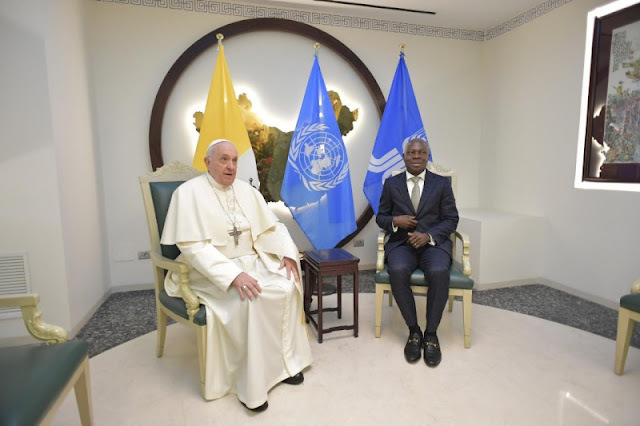 And since then, his successors have continued to encourage and give impetus to similar initiatives, among which one of the most noteworthy examples is the IFAD. This 42nd session of the Governing Council of the IFAD continues in this logic and has before it a fascinating and crucial work: to create unprecedented possibilities, to dispel hesitations and to put in each town in conditions to face the needs that afflict it. The international community, which drafted the 2030 Agenda for Sustainable Development, needs to take further steps to achieve the 17 objectives that constitute it. In this regard, the contribution of IFAD is essential to be able to fulfil the first two objectives of the Agenda, those related to the eradication of poverty, the fight against hunger and the promotion of food sovereignty. And none of this will be possible without achieving rural development, a development that has been talked about for a long time but that has not come to fruition. And it is paradoxical that a good part of the more than 820 million people suffering from hunger and malnutrition in the world live in rural areas, and – this is paradoxical – are engaged in food production and farming. In addition, the exodus from the countryside to the city is a global trend that we can not ignore in our considerations. Local development, therefore, has value in itself and not in terms of other objectives. The aim is to ensure that each person and each community may realize their own capacities fully, thus living a human life worthy of that name. It is necessary to help realize this, not from the top down, but with them and for them – “pour et avec”, as the President said. I urge those who have responsibility in the nations and intergovernmental organizations, as well as those who can contribute from the public and private sectors, to develop the necessary channels so that the appropriate measures can be implemented in the rural regions of the earth, so that they can be responsible architects of its production and progress. The problems that negatively affect the destiny of many of our brothers in the present time can not be solved in an isolated, occasional or ephemeral way. Today more than ever we have to join forces, achieve consensus, strengthen ties. The current challenges are so intricate and complex that we can not continue confronting them occasionally, with emergency resolutions. It is necessary to grant direct agency to the people affected by poverty, without considering them as mere recipients of aid that can end up generating dependency. Once a people grows accustomed to dependency, it does not develop. The aim is always to affirm the centrality of the human person, remembering that “new processes taking shape cannot always fit into frameworks imported from outside; the need to be based in the local culture itself” (Encylical Letter Laudato si’, 144), which is always original. And in this sense, and as has been the case in recent years, the IFAD has achieved better results through greater decentralization, promoting south-south cooperation, diversifying funding sources and modes of action, and promoting action that is based on the evidence and at the same time generates knowledge. I encourage you fraternally to continue on this path, which is humble, but is the right one. A path that should always result in the improvement of the living conditions of the most needy people. Finally, I share with some more specific reflections regarding the theme “Rural innovation and entrepreneurship”, which guides this session of the Governing Council of the IFAD. It is necessary to wager on innovation, entrepreneurial capacity, the agency of local actors and the efficiency of productive processes to achieve rural transformation, in order to eradicate malnutrition and to develop the rural environment in a sustainable way. And in that context, it is necessary to promote a “science with conscience” and place technology truly at the service of the poor. On the other hand, new technologies should not be contrasted with local cultures and traditional knowledge, but rather should complement and act in synergy with them. I encourage all of you here present, and those who work regularly in the International Fund for Agricultural Development, so that your work, efforts and deliberations may be for the benefit of the rejected – in this throwaway culture – and for the benefit of the victims of indifference and selfishness; so we can achieve the total defeat of hunger and a copious harvest of justice and prosperity. Thank you.